Apple launched is next version of iPad on March 2. It was as always an eventful day for all Apple fans out there. Most importantly Steve Jobs took time off his medical leave and appeared on the launch event. He said Apple has been working on this product for quite a while and he just didn’t want to miss it. The newer version of iPad comes with front and rear cameras for video conferencing and has options to opt for black and white version too. Some of the important feature of this new version of widget are. 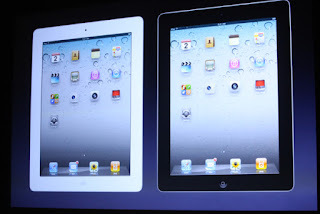 iPad 2 is supposed to be 33% thinner than its previous version. Meaning it is now only 9.3mm as against 13.4mm of iPad 1. Much lighter than the previous version. It is said to be 15% lighter. To summarize; Apple seems to again rule the Tablet market with these new developments. It has kept the prices of the iPad 2 same as the previous version but with so many new enhancements. So its going to be stiff competition to other competitors in the already getting crowded tablet market. So no wonder when Steve Jobs said during the launch “We think 2011 is going to be the year of iPad 2”.